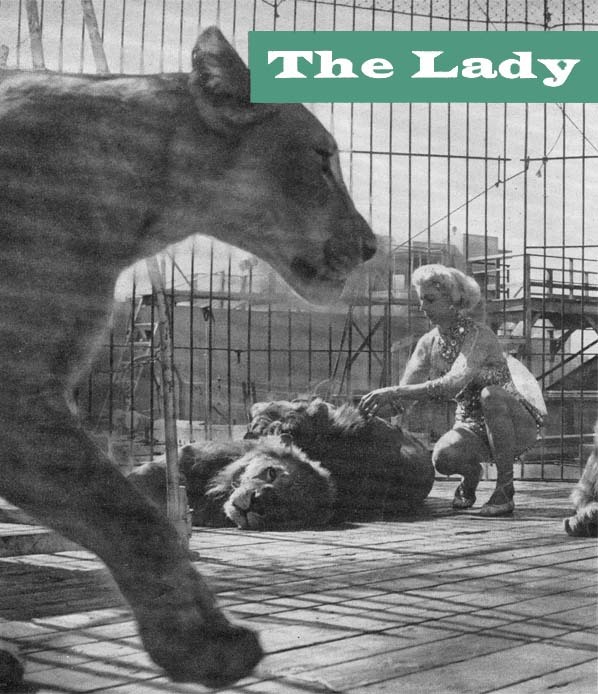 "YOU CAN'T PAY AN ANIMAL to get up on a perch and perform; only love can make him do it,: says Evelyn Currie, lion tamer and owner of a sensational new animal act. 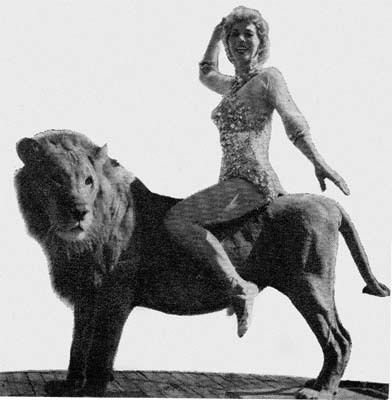 To prove her theory, Evelyn gets in the Cage with her big cats and lies on them, stands on them, hugs them, and dances with them, all without the usual boots, gun, and chair. On rare occasions she touches a lazy one, lightly, with a whip, but for the most part they perform, she says, because they're mad about her. 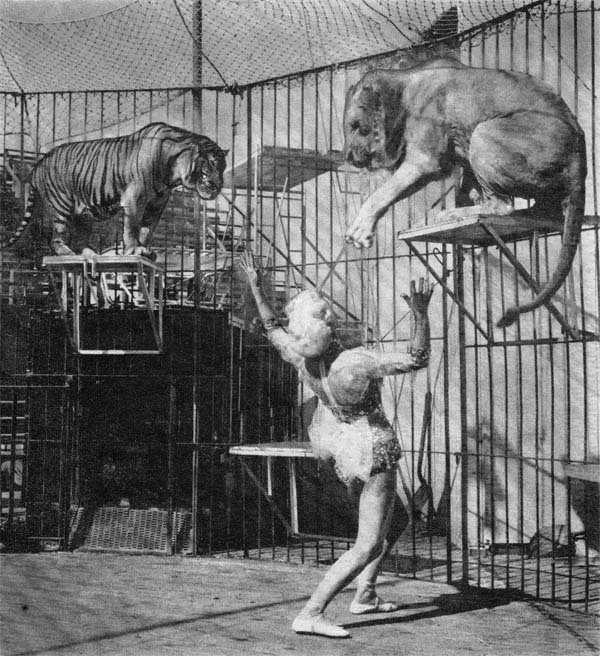 And although her theory doesn't always agree with the thinks of most animal psychologists, Miss Currie's wild-animal act is currently drawing big crowds along the carnival circuit. The only woman working with big cats, she has a really unusual act which includes a litter of tigon cubs born to one of her lionesses by a tiger father. She has been offered "fabulous" prices for the rare hybrids, but refuses to part with her '"babies." She handles them like a brood of kittens and they respond just like domestic pets. There are nine bests in the act, eating 1000 pounds of 50-cent-a-pound beef a week with eggs, milk and cod liver oil thrown in. The troupe travels in a large transport truck, and Miss Currie sleeps in the van. Third generation of her family to work in the ring, she is under contract to the Hamid-Morton Circus, and recently finished an engagement at Atlantic City's Steel Pier, where she will return next year. tiger and a lion, had bolted from its cage during a picture taking session for photographers. 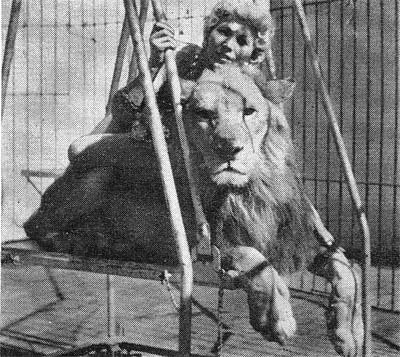 Miss Evelyn Currie, 29, a 115 pound animal trainer for the Hamid-Morton circus, wrestled with the tigon 30 minutes before attendants slipped a restraining noose around its neck. Miss Currie suffered a scratch on her shoulder. "I won't punish or frighten an animal to make him do a trick," says Miss Currie. It is her belief that all wild animals want to be friendly to humans, "even if they claw you a little." She frowns on blank pistols and other gimmicks used by other trainers, and says she prefers to keep her cats happy by cooing in their ears. It seems to work-she has never been clawed except for an accidental scratch or two, though she works closer to her animals than anyone else in the business today, and is getting top billing in shows across the country. 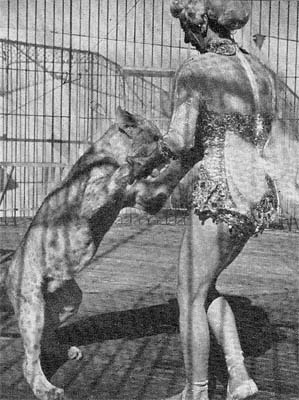 in March, 1960, when one of her half grown tigon cubs bolted from the cage into an area with 50 spectators, Miss Currie insisted that he wasn't dangerous, then captured the frightened cat barehanded, wrestling him to submission and holding him for a half hour until attendants could restrain him with ropes. She came out of the wrestling match with only a scratch, insisting that her main concern was for the tigon-she knew he wouldn't hurt her. :My cats know they can trust me," Evelyn says proudly, "and that makes them well behaved. Like people, they need lots of attention to be happy." She and her assistant, Argentinian Robert Frangi, never leave the cats alone, "so they can't get lonely." What ever she does, it seems to work. Vive l'amour!